Click Here to download the sermon. 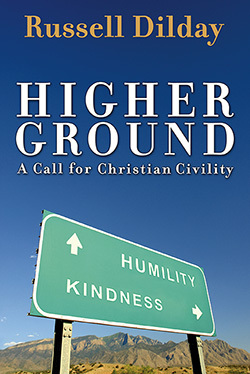 In his inspiring new book, Higher Ground: A Call for Christian Civility, Russell Dilday writes that it is time for Christians to move beyond the squabbles and struggles that characterize much of their interaction with one another these days and set their relations on a more biblical and spiritual path. We need to move beyond the lowlands of caustic controversy to the higher ground of Christian civility. The purpose of Higher Ground is not merely to point out what’s wrong or to cast stones at expressions of incivility. Instead, each chapter offers a “higher ground” alternative to the most troublesome forms of interaction between us. The book is an attempt to shine the lamp of experience on our history and let it guide Christians to learn a gracious, restrained, and well-mannered civility among one another. Russell H. Dilday is the former president of the Southwestern Baptist Theological Seminary (1978-1994), and has pastored churches in Georgia and Texas. He holds degrees from Baylor University (B.A.) and Southwestern Baptist Theological Seminary (M.Div., Ph.D.). He is also a retired Distinguished Professor of Homiletics at the George W. Truett Theological Seminary and special assistant to the president at Baylor University. Dilday currently serves as the chancellor of the B.H. Carroll Theological Institute.